There aren’t too many goals or awards in the golf world that have eluded the pride of Queensland golf Karrie Webb. So it was hardly surprising last week when the veteran professional had honorary membership of the PGA of Australia bestowed on her, in recognition of her services to the Australian golf industry. Webb, of course, already has an Order of Australia Medal along with seven major championships among her 51 world-wide wins. Yet her work behind the scenes in golf has gone virtually un-noticed and she has fostered Australia’s young talent in the women’s golf ranks for many years through the Karrie Webb series. Each year she takes two deserving young women players to the US so they can see how it’s done on the world’s biggest women’s tour. She has done that since 2008, with hardly any fanfare…which is the Webb way. Yet she was thrilled to receive the honorary membership from the PGA. “I’m really chuffed,” said Webb. 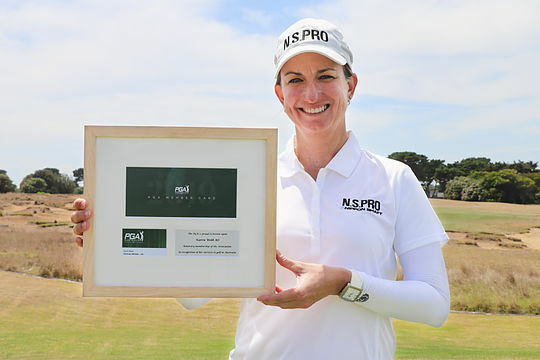 It was fitting that Webb received her PGA of Australia membership at last weekend’s ISPS HANDA Vic Open; a golf tournament that has led the way in equality in golf. “Obviously the Vic Open’s had this format for six or seven years now and what I love about it is it’s actually gotten the world’s attention now that the LPGA have co‑sanctioned and the men’s European Tour have co‑sanctioned,” said Webb. “I spoke to Geoff Ogilvy for the first time today: our paths just don’t cross.